In my third year of high school French, we got a pairs assignment: perform a 10-minute skit of your choice, in front of the class, and completely in French. I knew exactly what I wanted to do, and just hoped that I'd be able to spin it well enough for my partner (a friend) to get on board. A couple weeks, a stack of French-scripted index cards and several rehearsals later, my partner and I were positioned in front of the class - she standing, and I seated, or I should say - perched - on top of a stool, dressed in yellow, as French Morris the cat - the snarky* star of the (80s-era) 9Lives cat food commercials. For me, writing and acting in that 10-minute cat food commercial spoof was (and remains) the highlight of my entire high school French career. How had I not seen the writing on the wall? Although I went on to take a couple more French classes in college, I never pursued the language, nor pet-industry advertising, as a career. * The word "snark" didn't exist in the 80s. This morning on the Today show, in a strange coincidence, there was lighthearted discussion around a British survey that asked respondents to say whether or not they are in the career that they dreamed about as a child. Unsurprisingly, only 6% said they are. If they'd surveyed me, I'd have been in the 94% majority. I'm not a veterinarian. (Because who in her right mind - between 11-15 years old - aspires to be a French ad copy writer for pet-related brands?!) Besides, I'm pretty sure I wasn't meant to be a vet. It can be argued, however, that I was meant to write about animals, ad-spoofing very much included. What's still not entirely clear, is whether there will ever be a "career" of it. By the way, I was born optimistic. So, what's the moral of this story? Well, it's this: When you find passion as a child - even if it involves talking animals and toilet humor - if you run from it, it will hunt you down and poke you like a stooge, right in both eyes. Only let it poke you once, my friends. Because a true stooge - by the second poke - has mastered the thumb-to-the-nose, sideways-hand, poke-deflecting maneuver. And, for the record, I still get the urge to write in French sometimes. Only a little, though, because I'm way out of practice (and the last thing I need is to get shunned by grammarists in both English and French). I had one of those urges yesterday on my Facebook page (such a tolerant bunch, those Facebook peeps). If you recall, I mentioned something about Facebook in the title of this post. Surely, that means I intend to share what I wrote then, right? Post by The Chronicles of Cardigan. OK, how about a vintage 9Lives, Morris the cat commercial to redirect your thoughts?! Here's a fun article from BuzzFeed that claims Morris was the original Grumpy Cat. Although, I don't know that I necessarily agree with that. Morris would never agree to be a meme. So, has anyone else circled back to a passion you left behind in childhood? Do tell! As a child, I wished I could have a career that allowed me to get paid for reading and playing with my dog. I've got the work. But I haven't yet figured out how to get someone to pay me for it. 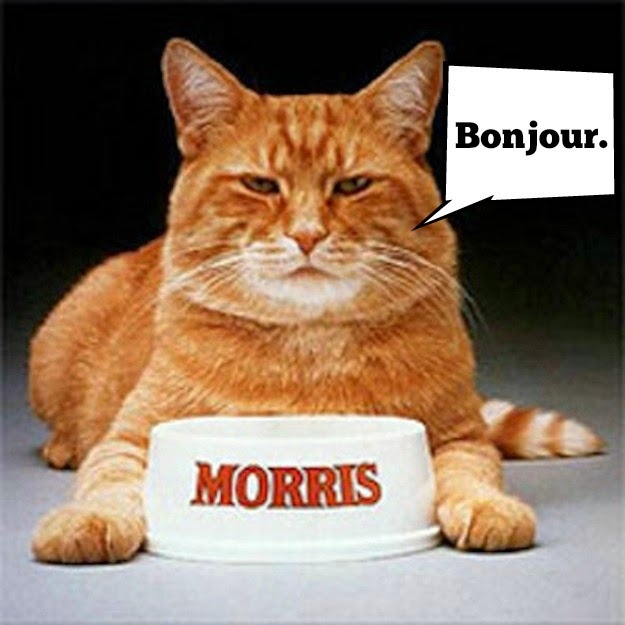 BTW, I got an email today offering me a chance to interview Morris the Cat for the blog. If you're interested, I could dig it out of my trash folder for you. Send me an email through SW if you're interested. Mom was a huge Morris fan, had his t-shirt and all! She also was a fan of the Meow Mix commercials. As for a career, she used to dress her stuffed animals and treat them like babies and in elementary school she wrote stories about them and drew the pictures herself. I guess our blog is an extension of that only in reality with real pets and photos. Sadly, it is not a full time career...yet! Such memories with that darn commercial. As a child I wanted to be a police officer - I dropped out of police academy after a few weeks when I was in college. Just wasn't for me. I can imagine your skit in my mind - I don't think I would have had the guts to do something like that in high school but I'm so glad you did. I'm very glad that you've continued with writing as well; your posts are always so vivid and inspiring. Our old family cat looked just like Morris. And acted like him too.